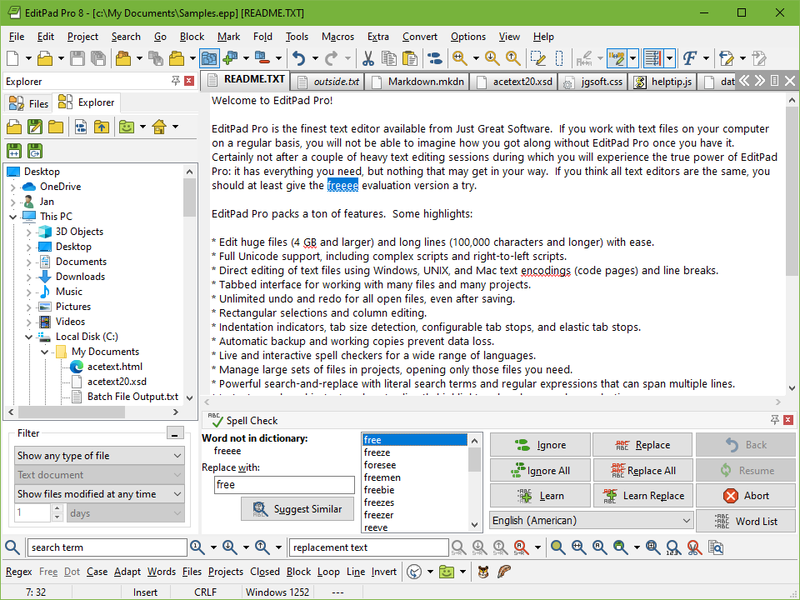 EditPad Lite is a basic text editor that is free for non-commercial use. EditPad Pro is a powerful and convenient text editor, totally useful for all your text editing tasks such as writing, web authoring and programming. You can buy EditPad Pro for only US$ 49.95. EditPad Pro is an extended version of EditPad Lite. Everything you can do with Lite, you can do with Pro. Though EditPad Pro has a lot more functionality, it will not get into your way. EditPad Pro is just as easy to use as EditPad Lite. Integrated spell checker. You can easily check the spelling of a single file or even all files currently open. The spell checker works together with the syntax coloring. If, for example, you are spell checking a Java source code file, it will only check words in strings and comments as these are likely to contain natural language. Anything else is very unlikely to be natural language and therefore skipped. The dictionaries are separate downloads so they do not waste disk space if you do not intend to use them. Syntax coloring for many popular file types. HTML, XML, CSS, Delphi, Java, C#, C++, VB, Perl, PHP, Python, Ruby, Eiffel, SQL and many more are supported out of the box. User-contributed syntax coloring schemes support a variety of file formats. You create and edit syntax coloring schemes with the JGsoft Syntax Coloring Scheme Editor. File navigation for many popular file types. HTML, XML, CSS, Delphi, Java, C#, VB, Perl, PHP, Python, Ruby and many more are supported out of the box. User-contributed file navigation schemes support a variety of file formats. You create and edit file navigation schemes with the JGsoft File Navigation Scheme Editor. Hexadecimal editor and byte value editor. EditPad Pro is perfectly suited for editing binary files. You can quickly switch between text and hexadecimal mode. Controlling external tools. You can add any external application to EditPad Pro's Tools menu. You can make the tools listed in the menu depend on the type of file currently active (it makes no sense to run a Java compiler on a C++ file). You can have EditPad Pro send the active file as a command line parameter or through standard input. EditPad Pro can catch the standard output and error into their own tabs so you can see what your tool is doing and save the output for later use or edit it. You can also continue to work with EditPad Pro normally while the tool is running in the background, perhaps peeking at the output every now and then. More extensive search commands such as highlighting search matches, incremental search and folding lines without search matches. Change the keyboard shortcuts of all menu items if you are used to different key combinations. Edit huge files without breaking a sweat, including files larger than 4 GB, even if your PC only has a few GB of RAM. Also, the maximum length of a single line is not limited, which is a problem with many editors claiming to support "unlimited" file sizes. File Panel to make it easy to work with hundreds or even thousands of files at the same time. Explorer Panel to easily open files and for basic file management directly in EditPad Pro. Built-in FTP client for conveniently editing your web site via FTP, and for uploading and downloading files from any FTP server. EditPad Pro can connect to as many FTP servers as you want simultaneously, which makes it very easy to manage multiple web sites. Built-in difference tool for comparing two files. Very useful for making you see the differences between two revisions of the same document. Since the difference function creates a new file showing the differences and similarities, you can merge two versions of a document easily by deleting what you do not want. Project functionality allows you to quickly open and save sets of related files, such as all the HTML files that are part of your web site, all the chapters of your next book, or the source code file of the application you're developing. Flexible and powerful editing with persistent selections and rectangular selections. Record and play back keystroke macros to easily automate otherwise tedious and time-consuming editing tasks. Bookmarks: you can use them to mark a spot and then quickly jump from one spot to another in a file. When you save a project, bookmarks are saved into it. Built-in email functionality so you can quickly send out texts to others. Sort function for putting the selected lines or the entire file in alphabetic order. The sort takes notice of the current Windows locale setting and lines containing special characters will be sorted appropriately. Comment block function. You can use it to prepend one or more characters you specify to each paragraph in the selected block (which can be rectangular), which is most useful for commenting out pieces of code in a language that does not support multi-line comments. See statistics of the file or even all files you are editing, including file size, word count, paragraph count and character count. Keep logs easily. If the first 4 characters of a file are .LOG, the current time and date will be appended to the end of the file when it is opened or refreshed, just like Notepad's .LOG function. Limit the length of each line in a file if the file will be used by software such as older email clients or newsreaders that cannot handle files with long lines. Automatically unwrap or rewrap the lines in files from software like older email clients or newsreaders that limit line lengths. Editing a plain text file with EditPad Pro. The explorer panel is docked to the left, and the search-and-replace panel to the bottom. "I was working with EditPad Lite for almost (I think) three years for all text editing I do on my three computers and it was just the best Editor I ever had ... well at least until the point I upgraded to the Pro version. Since I started to do some websites with html and php I wished the Lite version had different colors for html and php tags ... and see, [the Pro version] DOES. And not only that! I appreciate the fair licensing policy that I am allowed to install it on all my three computers (2x personal PCs and 1x Laptop)"
"At first, I was a bit reluctant about purchasing EditPad Pro since I was already using EditPad Lite. I figured that for the most part, EditPad Lite suited me fine. That was until I really started working with PHP, sometimes working with scripts ranging anywhere from 2000 lines or more. "Anyways, making sure that I had closed my brackets was getting to be a chore. Try debugging a PHP script searching for that one line that you forgot to add that one single end-bracket to. Anyways, with EditPad Pro's ability to automatically color-code PHP scripts and the ability to put your cursor in front of a bracket and then having it highlight its matching bracket, well, with that, I was instantly hooked on EditPad Pro. "I just wanted to say this because EditPad Pro really has made my life developing my PHP scripts a whole lot easier." If you have purchased EditPad Lite in the past, then you can upgrade to EditPad Pro at the discounted price of US$ 29.95 instead of the regular US$ 49.95. The amount you save is almost as much as the amount you paid for EditPad Lite. To obtain the discount, please enter your EditPad Lite user ID and email address below. You can only buy EditPad Pro at the discounted price directly from Just Great Software, and only by entering your EditPad Lite user ID below. The order form will clearly indicate the discount. Your EditPad Lite license will remain valid after purchasing EditPad Pro. You can use EditPad Lite and EditPad Pro at the same time on the same computer, if you want.